Falling gas prices and a contraction in building materials sales accounted for the majority of the decline in May’s retail sales. 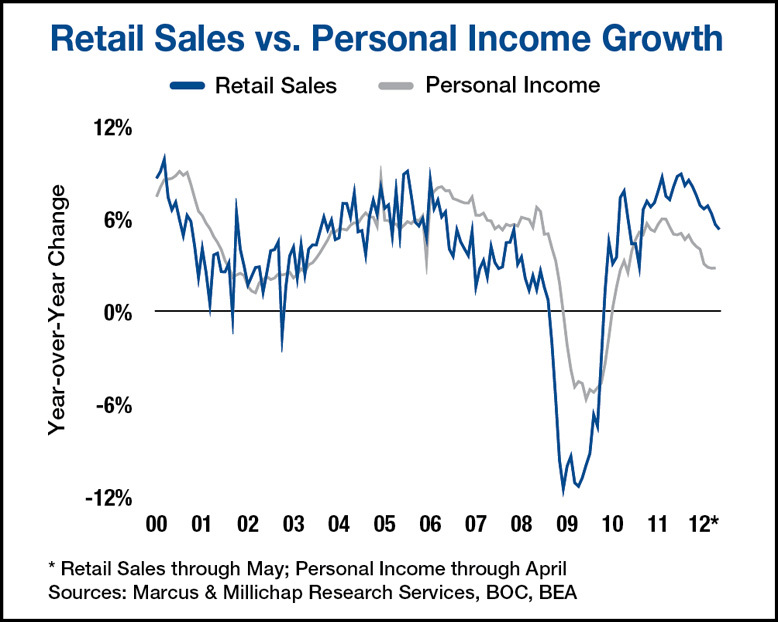 Viewed together with downward revisions to April sales and the lull in other retail segments, the results point to weaker spending concurrent with decelerating business investment. The details underlying tepid first-quarter GDP growth of 1.9 percent reveal subpar performance compared with earlier recoveries, and reflect the drag of both the eurozone recession on U.S. trade flows and hiring. In addition, sluggish income growth and recent stock market declines hit consumers at both ends of the economic spectrum. That said, spending may not be as weak as the data suggests. Lower gas prices clearly benefit consumers’ disposable income and unseasonably warm weather resulted in increased construction earlier in the year, thereby “pulling forward” building materials sales, representing the silver lining to this month’s report. Total retail sales dipped into negative territory, declining 0.2 percent for the month of May. Annualized sales reflect 5.3 percent growth, but continue a strong downward bias in year-over-year growth. Excluding motor vehicle and gasoline sales subtracts 100 basis points from May growth, but auto sales contributed a healthy 0.8 percent to monthly sales. Apparel, electronics and appliance stores also posted solid performance, with respective increases of 0.9 and 0.8 percent for the month. Non-store retailers remain a bright spot, measuring 1.3 percent higher for the month and annualized 12.4 percent growth as of May. Most other segments declined, including general merchandise, 0.5 percent lower, grocery stores and restaurants, both down 0.2 percent, and sporting-goods stores, down 0.1 percent. Consumer fundamentals remain in flux, benefitting from better balance sheets, greater credit availability, low inflation, and declining energy prices. Conversely, slower job growth, higher tax payments, and the expiration of unemployment insurance benefits undermine these strengths. However, leading indicators for job growth, including new job openings, have advanced to a four-year high, and regional manufacturing surveys that suggest stronger hiring plans. The eurozone recession and financial crisis will not resolve overnight and the ripple effect on the U.S. economy may limit near-term retail sales, although the nascent recovery in the housing sector will help stabilize spending. National retail fundamentals exhibit tangible improvement, with occupied space, now 7.2 million square feet higher than last year, finally nudging vacancy down 30 basis points over the last year to 9.7 percent as of the first quarter of 2012. First-quarter net absorption totaled a healthy 3.1 million square feet, while completions totaled 1.2 million square feet. Asking and effective rents posted marginal gains; forward projections for further vacancy declines will lift effective rents by year end. The sectors that power industrial demand, such as consumer spending, trade, inventory rebuilding and manufacturing, all decelerated in recent months. This should not have a material effect on mid- to longer-term demand if economic conditions improve as expected by year end. Nearly 15 million square feet of industrial space was absorbed in the first quarter. While the dearth in new completions tightened vacancy 70 basis points to 11.8 percent year over year as of the first quarter, despite attenuated demand and slower expansion. This entry was written by marcusmillichap, posted on June 18, 2012 at 11:47 pm, filed under Research and tagged Commercial Real Estate, consumer spending, Retail Sales. Bookmark the permalink. Follow any comments here with the RSS feed for this post. Trackbacks are closed, but you can post a comment. I don’t know if it’s just me or if perhaps everybody else encountering problems with your blog. I checked our blog on Google Chrome and Internet Explorer and the text looks normal on both browsers. Hi it’s me, I am also visiting this website regularly, this web site is really good and the viewers are genuinely sharing fastidious thoughts. the same old rehashed information. Great read! I’ve bookmarked your site and I’m including your RSS feeds to my Google account. sensible. I can not wait to read much more from you. This is really a terrific site. Hello, I enjoy reeading through your post. I lije tto write a little comment to suupport you.